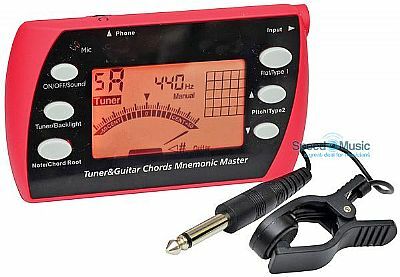 A fully chromatic Pocket tuner with a large LCD display and a backlight. Tuning mode is guitar, bass or chromatic from the internal mic, jack input, or the supplied contact pickup. The pitch generator option plays through rear speaker or headphones with side-mounted volume control. Adjustable A440 frequency from 435-445Hz. An on-board 240 chord library can be selected by root note and type and displayed in a virtual chord box with option to sound each note through the internal speaker or headphone. Comes complete with 2 x AAA batteries and fitted rear-stand clip. RRP £9.99: NOW ONLY £4.99 while stocks last. 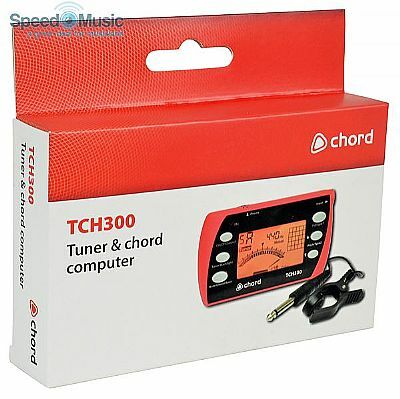 Chromatic guitar tuner for under £10! Large LCD display - great for dark environments.